British soul singer embarks on a world tour playing in every country and collaborating with local musicians. Joss Stone’s Total World Tour will see Joss become the first musician to complete a tour of all 193 UN registered countries in the world. Her aim is to bring people together using the universal language of music, show that no single country or person is more important than another, to share and promote the musical culture of each country by collaborating with talented musicians and artists and to develop partnerships with charity’s all over the world. The Total World Tour kicked off in April 2014 with gigs already completed in Morocco, Dubai, South Africa, Lesotho, Swaziland, Australia and New Zealand amongst others, and sees Joss embarking her most ambitious project to date. In each country Joss aims to collaborate with local home grown musicians, playing indigenous music as well as her own songs. Joss will also work with a variety of good causes and learn about important humanitarian and environmental issues throughout the trip. Each gig is spectacularly unique varying in size, audience and band setup; the gigs vary from packed concert halls to acoustic two piece shows. Joss has now played in nearly 100 different countries around the world and hopes to have performed in all of them by the end of 2018. 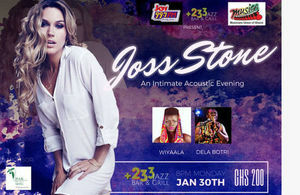 Joss Stone will be performing in Ghana at +233 Jazz Bar and Grill on the 30th of January with Noella Wiyaala and Dela Botri. Tickets are going for Ghc200 at the gate. Joscelyn Eve Stoker better known by her stage name Joss Stone, is an English singer, songwriter and actress. She rose to fame in late 2003 with her multi-platinum debut album, The Soul Sessions, which made the 2004 Mercury Prize shortlist. Her second album, the similarly multi-platinum Mind Body & Soul, topped the UK Albums Chart for one week and spawned the top ten hit “You Had Me”, Stone’s most successful single on the UK Singles Chart to date. Both the album and single received one nomination at the 2005 Grammy Awards, while Stone herself was nominated for Best New Artist, and in an annual BBC poll of music critics, Sound of 2004 was ranked fifth as a predicted breakthrough act of 2004. She became the youngest British female singer to top the UK Albums Chart. Stone’s third album, Introducing Joss Stone, released in March 2007, achieved gold record status by the RIAA and yielded the second-ever highest debut for a British female solo artist on the Billboard 200, and became Stone’s first top five album in the US.